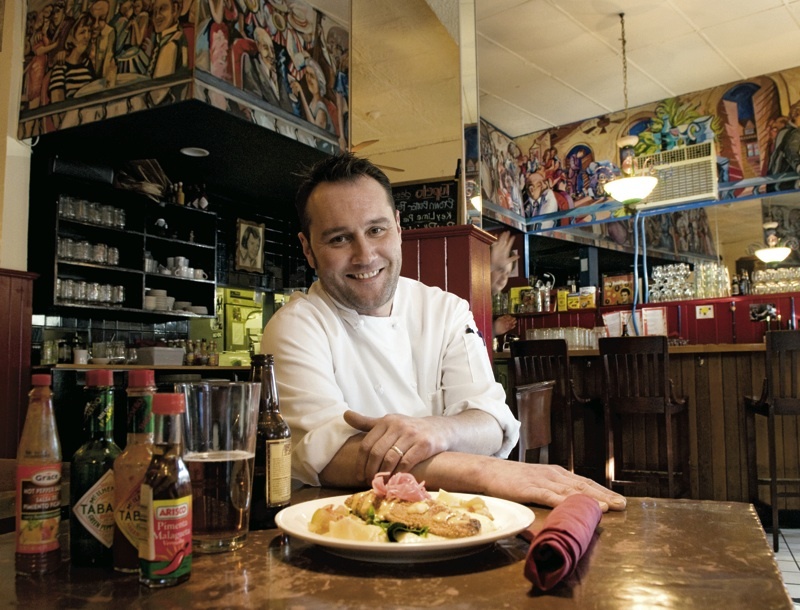 Above: Tupelo chef Rembs Layman prepares satisfying fare: here, fried catfish. The food at Tupelo is wonderful, my dinner companions and I would say, with just a quibble here and there. The mashed potatoes, the pickles, and the cheddar grits live in memory—no kidding—and I doubt you can get better fried oysters anywhere on earth. The place is small, has dark-red-and-cream walls, and retains from Magnolia (its predecessor Southern restaurant in these confines) the colorful murals of New Orleans, the copper-topped tables, and the homely informality. Tupelo is deservedly popular. When it’s full, it’s very noisy and conversation becomes a chore. No reservations are taken for later than 6:30 p.m., and you may have to huddle by the bar with a beer or glass of wine to wait for a table. Tupelo may be a happier place for the resilient young than for the chronologically challenged, who may prefer a more comfortable trough. Things get off to a bad start when your friendly waiter plunks down on the table your water glass—a wide-mouthed, quart-size jar filled with water (but no ice). This touch, if intended to be down-home, misses its mark. After ridiculous comes sublime. Those fried oysters ($10), a starter, are crunchy on the outside and explode with briny flavor within. They come with a moderately nippy remoulade and slices of delicate, smoky, house-made pickled cucumbers and onions—a gastronomic high point. In season, the pickles give way to fried green tomatoes. Another starter is turkey meatballs ($7) in a spicy sauce “with French bread for mopping up.” A third is watercress salad with roasted pear, herbed goat cheese, and candied pecans ($7). A vegetarian might follow that with flavorful champagne crepes filled with ricotta cheese and fresh basil with a tomato vinaigrette ($14). The roasted half chicken ($16) is bathed in a bourbon-maple barbecue sauce that its consumer in my group thought disguised the chicken overmuch. It comes with maple-flavored spaghetti squash, greens, and sweet onion pickle. Cheddar grits of mild taste and pleasing granularity sing in delicious harmony with inherently bland but perfectly pan-fried catfish and accompanying tomatillos and piquant remoulade ($16). Charleston’s Post and Courier allegedly once proclaimed that “a man full of grits is a man of peace,” and so why is it that grits aren’t gobbled up world round? Rembs Layman, the maestro in the kitchen, orchestrates beef brisket ($17), slow-cooked in red wine and fork tender, into a symphony of tastes and textures: a drizzle of horseradish cream, vinegary collard greens cooked just off wilting, and marvelous mashed potatoes. No secret ingredient; they are made with plenty of butter and cream and a touch of chives. Don’t overlook the tart key lime pie or the definitive pecan pie with ice cream ($7 each) if you have room for dessert. Tupelo’s food is a bargain: four people, a bottle of wine, a couple of beers, and the tip, for less than $200. Another option: call ahead and get all menu items to go home with you, although it would seem a shame to keep any of this food waiting. Above the pass-through window to the kitchen hangs a drawing that is meant to depict Elvis Presley, and there’s a bust of him in the kitchen. The King was born in Tupelo, Mississippi. I bet he would have enjoyed this place.